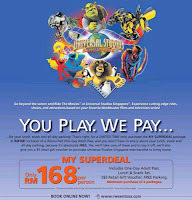 USS RM168 per person MY Superdeal! Includes One-Day Adult Pass. Lunch & Snack Set. S$5 Retail Gift Voucher. FREE Parking. You play. USS pay for your lunch, snack and all-day parking! 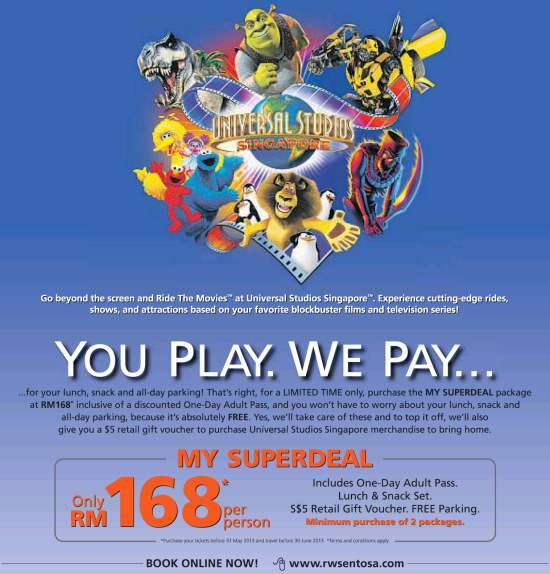 For a limited time only, purchase the MY SUPERDEAL package at RM168 inclusive of a discounted One-Day Adult Pass, and you won't have to worry about your lunch, snack and all-day parking, because it's absolutely FREE. Minimum purchase of 2 packages. LIKE & SHARE out this great promo!